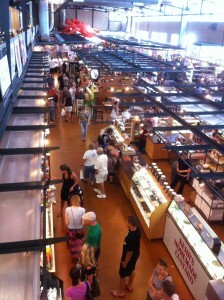 The Milwaukee Public Market in Third District is the place to be for an unique selection of artisan foods. There is a wide variety and a large selection of vegetarian items. My biggest struggle was narrowing my choices. The first floor of the market is packed with restaurants and stores offering local foods, drinks, flowers and kitchenware. Select items either to go or eat in. Plenty of tables for dinig are available upstairs or outside. We purchased foods at one location and ate at another vendor where we purchased drinks. I found many vegetarian selections to choose from including items at Aladdin – Taste of the East, Pita Works, The Soup & Stock Pot, The Green Kitchen and Margarita Paradise. Follow the Milwaukee Public Market on Twitter and Facebook.